ASHBURN, VIRGINIA—OCTOBER 26, 2018—Johnny Mac Soldiers Fund is the recipient of the 2017 Zachary and Elizabeth Fisher Distinguished Civilian Humanitarian Award. 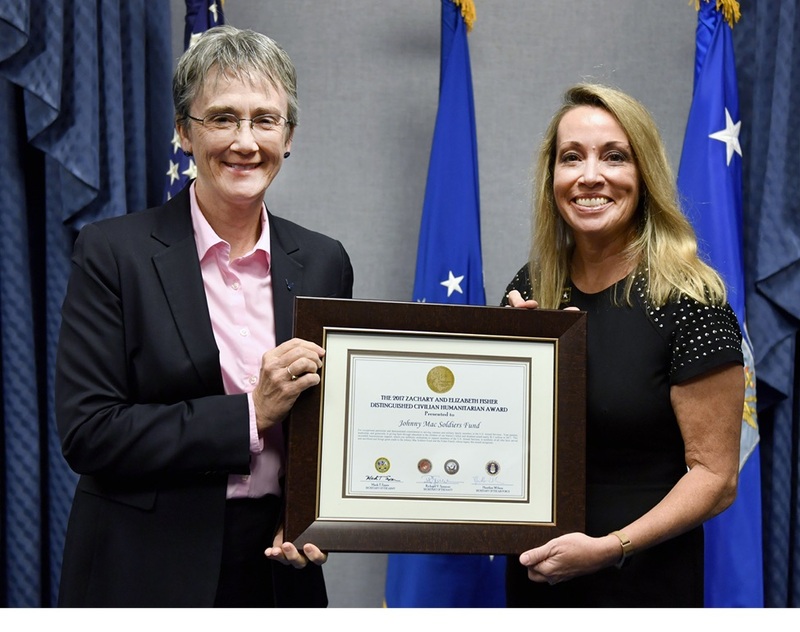 Secretary of the Air Force Heather Wilson presented the award to members of the organization’s board of directors in a ceremony at the Pentagon on October 22, 2018. Johnny Mac Soldiers Fund was established in 2014 by a group of West Point classmates to honor service and sacrifice by providing scholarships and education opportunities to veterans and military family members, especially children of the fallen or disabled. Their inspiration was their classmate Colonel John “Johnny Mac” McHugh, killed in action on May 18, 2010 while deployed to Afghanistan. Colonel McHugh left behind a family of five children. “Since 2014, Johnny Mac Soldiers Fund has awarded over $10 million in scholarships to deserving military children. Those kids need to know that when their military parents deploy—and some do not return—that we have their backs,” commented Tony Guzzi, Johnny Mac Soldiers Fund co-founder and Chairman, President, and CEO of EMCOR Group, Inc. Established in 1996 by the Secretaries of the Army, the Navy, and the Air Force, the Zachary and Elizabeth Fisher Distinguished Civilian Humanitarian Award is a multi-service award designated to recognize and reward an individual or organization demonstrating exceptional patriotism and humanitarian concern for members of the Armed Forces or their families. Presented annually, the award is named in honor of Fisher House founders Zachary and Elizabeth Fisher, both of whom contributed extensively in support of service members and their families. MaryEllen Picciuto, President, Johnny Mac Soldiers Fund, accepted the award and credited the board of directors and the Fund’s supporters for their passion and dedication to advancing the organization’s mission. Secretary of the United States Air Force, Heather Wilson (left), presents Johnny Mac Soldiers Fund president, MaryEllen Picciuto, with the 2017 Zachary and Elizabeth Fisher Distinguished Civilian Humanitarian Award, given annually to an individual or organization demonstrating exceptional patriotism and humanitarian concern for members of the Armed Forces or their families. Since 2014, Johnny Mac Soldiers Fund has awarded more than $10 million in scholarships to military veterans and their family members, especially children of the fallen or disabled. Credit: Wayne Clark.